Next week, school children will bring home cheerfully crafted Thanksgiving-inspired hand turkeys and pilgrim hats. Families and friends will travel to mark another year, perhaps focusing on gratitude, perhaps doing little more than tolerating one another as family bonds fray amidst divisive political forces. Either way, one thing we can count on is the ongoing, often unintentional, perpetuation of the Thanksgiving story, a national myth as pristine as the New England shores the Pilgrims claim to have discovered. Thanksgiving’s aspiration to be a day of celebratory togetherness is beautiful. Ironically, and unfortunately, the Thanksgiving story is a prime example of what drives us apart as a nation. When we aren’t operating in reality, it’s hard to find common ground. Thanksgiving stories of harmonious Pilgrim-Indian unity couldn’t be further from the truth. Taking the time to learn how Indigenous people tell “Thanksgiving” history, and braving ourselves to disrupt the manufactured feel-good myth told in white communities, may, ironically, help us feel better in the long run. The truth has a way of freeing us from circular thinking and repetitive arguments. In my work to expose US racial cover-ups, I’ve witnessed the way replacing mistruths and omissions with fuller, more accurate information often begins an unfolding of ah-ha’s that cross boundaries. Though some will dig in their heels, others will humbly admit, “I didn’t know that.” Like revealing any family secret, initially painful truths eventually give way to clarity and healing. Below are three strands of the Thanksgiving story I challenge you to disrupt this year. STORY #1: Thanksgiving is a 1621 Pilgrim invention and has been celebrated every year since. Untrue. Thanksgiving did not become a national holiday until 1863 when President Lincoln and Secretary of State William Seward, amidst the Civil War, proclaimed the holiday in hopes of inspiring a national healing. 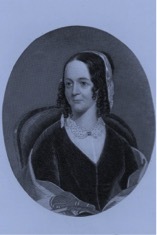 It’s likely that a letter from Godey’s Lady Book editor Sarah Josepha Hale (above) contributed to Lincoln and Seward’s decision. She’d been lobbying for the holiday for decades. STORY #2: The 1621 Thanksgiving was a joyful celebration of friendship between Pilgrims and Natives. Untrue. But what a lovely idea. It’s this very fantasy that distracted me from even imagining there were lost truths to be found. Why would I? I loved the idea of sharing and being grateful. It aligned nicely with my self and family identity. Much is unknown about the 1621 gathering as only two primary sources, brief diary mentions, exist. Some Indigenous people believe the real story is more like this: The Pilgrims gathered to celebrate and eat their first successful harvest. Massasoit and 90 Indigenous men showed up for reasons unknown. That no women or children were among their party suggests to me that this was less social and more business. Many Indigenous people wonder if Massasoit gathered a large group (safety in numbers) to investigate the gunshots that would’ve been heard as the Pilgrims hunted fowl. Further, the thinking goes, once Massasoit and company observed it was merely a feast, perhaps they chose to hunt those five deer in order to contribute to the feast. After all, ninety additional mouths to feed would require more food. Ouch. This is not what I was taught. STORY #3: All the real Indians died off. Untrue: Indigenous people are very much still here. In fact, just this month two Indigenous women were elected to Congress. US Indigenous populations representing hundreds of tribal nations are growing in number and visibility. New technology allows a quick search to find websites, podcasts, videos, books, films, apps, and articles broadcasting the voices of Indigenous people. Expect to see and hear more from this land’s First People in the years ahead. Expect their truths, if they are new to you, to hurt. A lot. 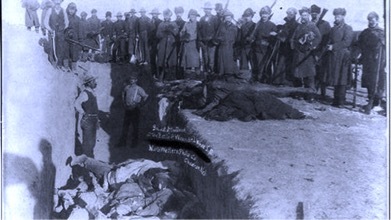 The attempted genocide against Indigenous people completely and totally aligns with all five criteria established by The United Nations 1948 defintion of genocide. ✔ Forcibly transferring children of the group to another group. Are you as surprised as I was to learn that Adolf Hilter drew inspiration and tactical lessons from US approaches to genocide used against Indigenous people? Specifically mass graves, starvation, and concentration camps? What could be further from a happy cross-racial neighborly feast than genocide? 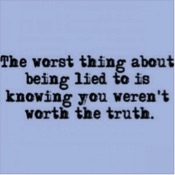 We all deserve the truth. Our children deserve the truth, as they will inherit the trauma and discord sown by a myth-laden past. This year, as you carry on your favorite family traditions, please join me in breaking from the tradition of passing along the myth of Pilgrim-Indian harmony. Where Did the Images On This Page Come From? Click on the below to find out.